It is time that media played its constructive role to the hilt. It must take up and share positive stories, thoughts and action from Chennai. Unfortunately, my experience shows that positivity will not find as much space as the Mukherjea’s. It will die its natural sudden death. The argument that positivity does not sell will be put forward. We will be told that this is not what the consumer (reader, viewer and listener) wants. How wrong can media be in their myopic understanding? In the gloomy state of darkness- the faint silver lining of hope and positivity is all one seeks. Something that prompts to believe it exists. That tells that it is the right path to follow. Your words and thoughts do not define the world you live in. You define the world you like in by the words and thoughts you use and have. I seriously believe that we can move towards creating a better world if we can present it so, if we can help everyone see the beauty in it and visualise it. Want to cherish it, smell it and then as a natural outcome live the experience. Oh! So naive I can be. I will be called blind with emotion and an optimist. I am willing to live with these tags, as I know we it is the right way. Let me share what happened yesterday. There was a fire in Dammu Nagar, slums near my house in Kandivali East, Mumbai. It made to front page and main headline of ‘NavBharat Times’, and a mention-in-passing in the mighty ‘Times of India’. 2000 houses burnt, 2 dead 13 injured with 65 gas cylinder blast and it made only to the Marathi channel and few other news channel did pick it up. Maybe they are right it is not something that is huge. 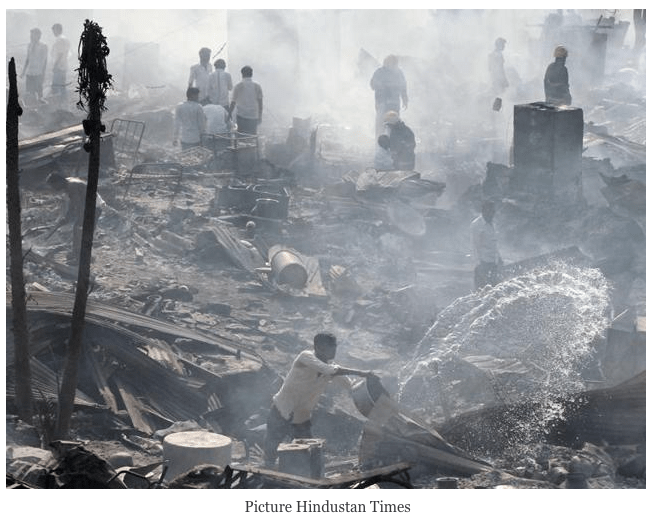 It was definitely not a fire in Colaba or Pali or Malabar hills. That is not the point. What heartened me was the way the people went out of their way to help the affected people- who we refer as the lower middle class, the drivers, maids, daily workers- they live in Dammu Nagar. Someone who is never counted and does not matter in the everyday scheme of things. They only matter during elections, as they are the real vote banks. The fire happened in the afternoon and was under control before evening. But, the affected people were not allowed to go to the hill area to their houses. Make shift arrangement was made in Garden at Lokhandwala. It was okay with current Mumbai weather. And then we saw people going with food, biscuits, blankets and what ever they felt the affected families might need. Young kids created their own impromptu gangs that went on collection drive. 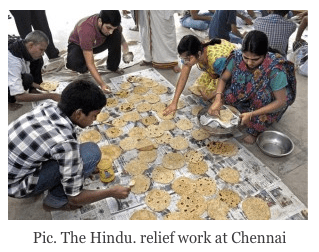 Was this the immediate follow through of Chennai volunteerism or were people genuinely so good-natured. I believe people are good at heart but the magnitude of the outpouring and volunteering help was a definite affect of Chennai. I have observed this changed behaviour after every natural calamity- be it Nepal, Uttrakhand or Chennai. Have seen this in and after riots. We as a nation get galvanised. We get charged. The after effect is short lived. I understand the argument bad is nothing but absence of good. For life to continue polarities must co-exist. Yet, I believe instead of balance there can be positively polarised behaviour and environment. Maybe as ever I am an innocent optimist. The question that hits me hard is- Do we as a nation have to depend on natural and man-made calamities to every time remove the dirt and slime of our murkier thoughts and selfish behaviour.